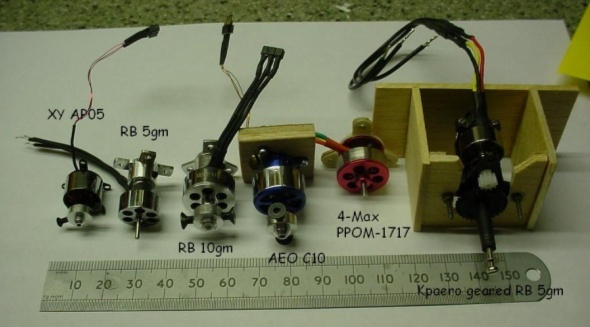 Introduction : For 2011 the BMFA are allowing a 60s motor run using 3 x 50mah Sanyo Nicads or 1 x 70mah LiPo cell. The propeller options remain the same at 6" maximum and must be of commercial origins. 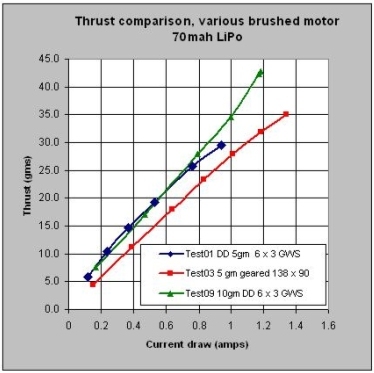 Robotbirds 5 and 10gm brushless motors were tested in a thrust rig alongside a geared kpaero 5gm motor, an 11.4gm 4-Max motor and an XY AP05.Various pitch propellers were used with an RCtronics 70 mah 20C (alleged) battery. 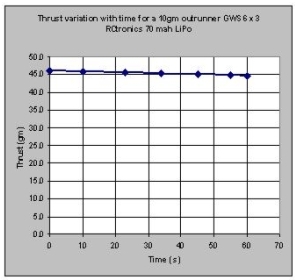 For 2011, the more thrust generated the better, within the limits of battery technology, 20C discharge assumed. In practice, this means finding the motor and propeller match that achieves maximum thrust for 1.4amps maximum and battery voltage > 3.0v at the end of a 60s run. Tests were run from zero to 100% load in steps using the load setting facility of the servo tester. 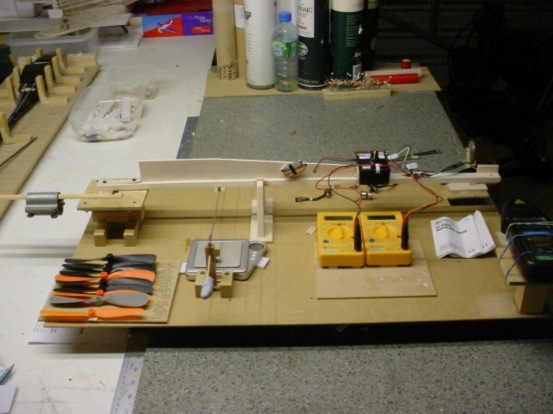 The test motor is mounted on the right of a light horizontal balsa swinging arm. A 3mw laser tachometer measures propeller speed and a pair of DVM's measure volts and amps. Motor thrust is reacted on a gramme scale. An E-Sky servo tester with pulse width visual display provides a logic level input to a Robotbirds 6a ESC. The rig design gives a 5:1 mechanical advantage. (gramme scale reading is divided by 5 to improve accuracy and repeatability). This data has been published some 18 months ago, but is repeated for completeness to emphasise that the 70mah LiPo has almost double the energy content of the 50mah Sanyo's. Weight comparison is 2.8gm LiPo, 11gm Nicads. Recommended battery type should be obvious. Increasing the propeller pitch on the direct drive motor using a GWS 6 x 5 slowfly (black) was a retrograde step. Swopping the 138 x 90 propeller for the GWS 6 x 3 (green) on the 5 gm geared motor failed to achieve the 35gm thrust performance of the kpaero setup. The figure compares the thrusts of a 5gm direct drive motor (blue), a 5gm geared motor (red) and a 10gm direct drive motor (green). 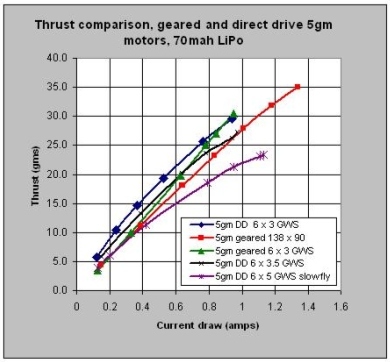 By far the highest thrust is given by the 10gm direct drive motor using a relatively unexciting GWS 6 x 3. Current draw is close to 18C. This will unload in the air. There is some scope for a more aggressive propeller match (if it can be found) to approach 20C in the air. Further tests were run with a CAM 5 x 5 , a GWS 6 x 3.5 and a 6 x 4 folder cut down from a Potensky 8 x 4. None of these outperformed the GWS 6 x 3. An 11.4 gm motor from 4-Max was tested. This motor was more efficient than the 10gm but peaked out at 1.0 amp or 37gms thrust and could not match the 43gms of the 10gm RB motor. An XY Motors AP05 was also tested. Efficiency was very poor but the battery successfully pulled 1.5 amps or 21.7C with a voltage of 3.32. 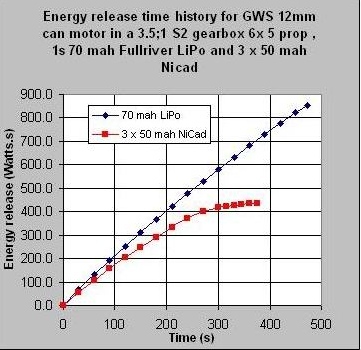 The 10gm direct drive motor with the GWS 6 x 3 was run at 100% load for 60s. Thrust is maintained at 46-44 gms throughout the motor run with current draw ranging from 1.27 to 1.22 amps about 18C. Voltage holds up at 3.3volts minimum. Propeller speed is maintained at 5600- 5474 rev/min over the entire motor run time. At the end of the motor run, only 30% of the battery energy has been consumed and the battery recharges OK to 4.2 v.
Constrained by space, the 5gm kpaero geared motor with kpaero 138 x 90mm propeller will provide more thrust than a direct drive 5gm power unit. The highest thrust, so far, is provided by the RB 10gm direct drive motor with a GWS 6 x 3 propeller. .this will unload in the air, but by how much? ?